Both VPN.ac and AirVPN get rave reviews around the internet. Both services are a techies dream and if you really value protecting your privacy and it’s your number one consideration then both services should be on your radar. That’s not to say other services don’t protect your privacy but we all have different needs and while some VPN services are more suitable for streaming blocked content, both VPN.ac and AirVPN could be considered the daddies of encryption. Choosing between two seemingly similar providers can be difficult and with not too much difference in price it can be hard to make a decision. We’ve been taking a look at both providers and put them head-to-head to help you make a buying decision and find out ultimately which is best. VPN.ac is a Romanian based security company focused on putting privacy first. It wouldn’t be uncommon for the general public to not have heard of VPN.ac because they do very little advertising and instead concentrate on offering a secure and private service. The service is run by security professionals and boasts some of the fastest speeds in the industry with some of the highest security credentials. Offering features and encryption modes not available from most other providers they’re certainly one of the top security conscious VPN services. Truthful publication about what the service can and can’t do. Not too many server locations. AirVPN is an Italian based VPN provider that often receives rave reviews by those in the security community. Like VPN.ac they don’t heavily advertise and are favoured by those who are concerned about protecting their online privacy to the highest level. The service is geared towards users of an intermediate to high expertise level and there are no mobile apps to make easy connection, instead you’ll need to manually set up on those devices. No logging of your online activity. Price is often a consideration when it comes to choosing anything, although when your online privacy is at stake it shouldn’t be your main consideration. Thankfully both VPN.ac and AirVPN are two of the cheapest providers in the industry, that is as long as you’re prepared to sign up for an extended period. On a monthly and 6-month basis, AirVPN is ever so slightly cheaper but when taking a full 12-month account VPN.ac just pip AirVPN to the post. There isn’t a huge amount of difference between the two so for that reason, this category is definitely a draw. 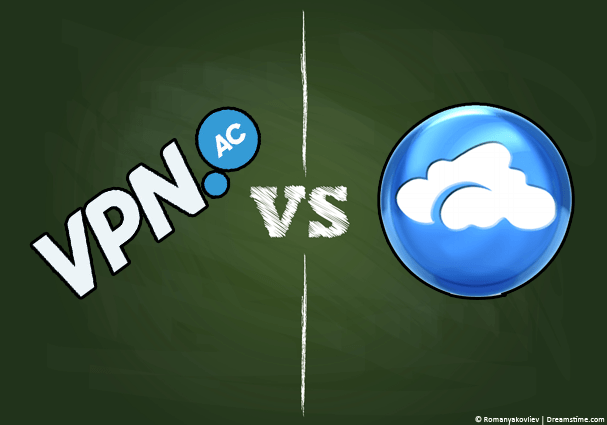 VPN.ac and AirVPN are two of the most security and privacy conscious providers in the industry. For that reason alone it’s hard to separate the two. VPN.ac provide access to the PPTP, L2TP and OpenVPN protocols whereas AirVPN offers OpenVPN solely. Both providers make it clear that PPTP is insecure which is one of the reasons why AirVPN don’t offer it, however it’s nice to have the choice. Both providers offer a 4096 RSA key for handshaking which is one of the highest in the industry. Both services offer encrypted custom DNS servers that protect the names of the URLs accessed so it’s impossible to separate them on this score. Where VPN.ac slightly edge AirVPN is they offer access to OpenVPN ECC and Xor which as far as I could ascertain isn’t available from AirVPN. In terms of security there isn’t too much between them so again it’s a draw. When dealing with providers that favour security and encryption over quantity you’ll often find a reduced number of servers. In recent years VPN.ac have expanded quite rapidly and now offer server locations in over 21 countries around the world. AirVPN on the other hand cover just 16 locations. Both providers pride themselves on selecting locations after a thorough vetting process which ensures they’re suitable for protecting your privacy. You’re never going to get masses of server locations with either provider but you can guarantee they’ll be top quality locations. In terms of server locations though, VPN.ac is the clear winner. Both services are compatible with all devices if you’re prepared to set them up manually. VPN.ac however have software for Windows and Mac and apps for Android and iOS so if you’re a beginner then you can get connected with just one or two clicks. AirVPN on the other hand is lacking a little. While they have software for Windows and Mac they don’t have any mobile apps. They do have an extensive guide on how to set the service up on mobile devices and it’s not that complicated, but if you’re new to VPN use or not good with computers then it will probably be outside of your technical skill. For ease of use and support VPN.ac is easily the winner in this category. Essentially both VPN.ac and AirVPN offer customer support via support ticket. It’s the main method of contact. VPN.ac do have a couple of other methods of contact including Wire, XMPP/Jabber and Skype. While the main method of support is support ticket there isn’t a lot of difference between the two services but with a few other support methods offered by VPN.ac they just pip AirVPN to the prize in this category. It’s a very close call between the two providers and both offer some excellent features that aren’t available from a lot of other providers. Although AirVPN is slightly cheaper on both a monthly and 6-month package, VPN.ac are the cheapest when taking an annual account. Even though it was very tough to pick a winner VPN.ac just beat AirVPN on most categories and if you’re trying to decide between the two of them then VPN.ac offers ever so slightly the better service. VPN.ac offer a 7-day money back guarantee so if you try them and are unhappy for whatever reason you can always get a refund. Have NSA revelations hurt US tech?